Installing an SSD to your old laptop is a surefire upgrade that will improve the laptop’s performance (and your patience). Since laptops are usually difficult to upgrade in meaningful ways due to the rigid, compact structure of the hardware, people usually resort to laptop specialists or simply buy a brand new laptop. 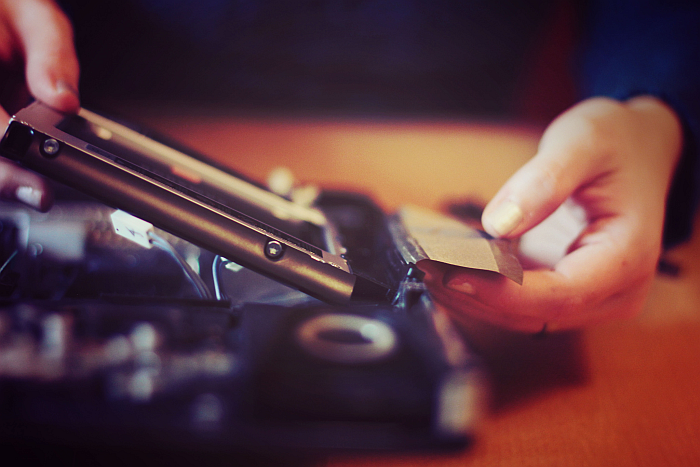 Fret not however, we’ll give you a simple, step-by-step instruction on how to install a brand new SSD into an old laptop. You first need to acquire the SSD to upgrade. If you’re unsure, consult the 2019 SSD Buying Guide. Good news is that SSD prices have fallen considerably in the past years—about a 30-40% since current models like Samsung EVO 860 or WD Blue 500 GB were first released. SSDs come in several form factor dimensions. The one that you want to pay attention to for most legacy budget laptops is a 2.5-inch SSD that connects over a SATA III interface. The final step is deciding the storage capacity, and it all comes down to how much space you need for your business. If you want some future-proofing or need to store larger media files, go for 500 GB or above. If not, 250 GB is usually standard. If you’re wondering which drive is the best fit for you, check out the 2019 solid state drive (SSD) buying guide. You’re saying bye-bye to your old, dusty hard drive, so you need to do something about the files. Since you most likely want to keep the files, you’ll need a USB-SATA adapter cable to migrate your data from the HDD to the SSD. Install the data migration software with the CD (comes with the SSD) and simply follow the instructions. Perhaps the most dreadful part about the entire installation process is waiting for the data migration to complete (but it’s worth it). In order to replace the HDD, you need to execute some physical hardware work—fortunately, it should be a fairly simple, straightforward process. First step is to unplug any cables from the laptop and turn it off. On most laptops, you can look on the bottom of the laptop to locate a rectangular or L-shaped panel with screws. Of course, laptops can vary in design and structure, so if there is any doubt or questions, use the instruction’s manual or search online to see the hardware breakdown of your laptop model. Second, locate the HDD. HDDs all look alike—they’re 2.5-inch, rectangular, and metallic and are incased in a caddy to secure the drive. Unscrew any hinges that the case might have and unplug the drive from the SATA connector. Finally, the moment you’ve been waiting for: replace the hard drive with an SSD and reassemble all the pieces and parts back into their original forms. If you simply transferred all the data using step #2, there should be no problem because you already have an existing OS on the SSD as well. If you wanted to re-install Windows 10, you then need the installation disk to re-install it. The laptop may take a second to read the new drive and it may even need a reboot, but apart from that you’re good to go. You’ll notice the faster load speeds from the initial system boot up to the multiple programs and this is the beauty of SSDs. Much of our complaints and problems with older laptops stems from the lack of SSDs because they were very pricey back then. With the considerable price drop and the ease of hardware swapping, think again before retiring that perfectly functional “old” laptop. Installing an SSD is simple and inexpensive enough to extend the life of your computer.